I have loved stories ever since I can remember. I love hearing them, reading them, and making up my own. And there are so many different kinds. I like true stories, as well as made-up stories, funny stories, adventure stories, and mysteries. In each of my picture books, I tell a true story. A true story is also called nonfiction, because it’s not made-up. 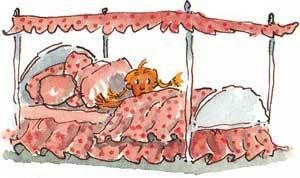 I got the idea for my first book, Bedtime!, when I was getting into bed one night! As I burrowed under the covers, I began thinking about all the different kinds of beds there are: hammocks, sleeping bags, and water beds. But I wanted to know more. I wanted to know how Native Americans slept, and desert nomads, and people in ancient Rome. History, for me, comes alive when it tells the story of how ordinary people lived. When I do the research for one of my picture books, I spend a long time, almost a year, hunting for the interesting and amazing facts that will help me tell my story. And I am very careful to make sure my facts are true. Doing research is fun. It’s like going on a treasure hunt—you never know what you’ll find out. I often start by reading general books on the subject in the library. The children’s section usually has short simple books to get me started. As I read, I learn what new questions to ask. As I get further into the research (trying to answer all those questions! ), I talk to anyone who might be able to help me. I call people on the phone. I visit places for first-hand information. When I worked on the candy book, How Sweet It Is (and Was), my two boys were happy to report back on the latest flavors and the best new brands. At the end of almost a year, I take my pile of notes and use only the most interesting information I’ve found. Then I try to tell the story as simply and clearly as possible—and fit it into the space of a 32-page picture book. I love finding out about everyday things, things like beds, hair, candy, or underwear that can be so ordinary we forget to notice them. But there are wonderful, funny stories about them. And history, after all, is just one story after another, about people like you and me. Now, with my novel, One Good Thing About America, I’m writing fiction. I’m making the story up from my imagination, though I have to tell you I use so much that I see and hear at my school. I have tried to see things through the eyes of a new student from another country. For example, if you were new, would you really want to eat something called a Sloppy Joe? Asking questions like, “What if…?” and looking at things with fresh, new eyes are two good ways to get ideas for writing.